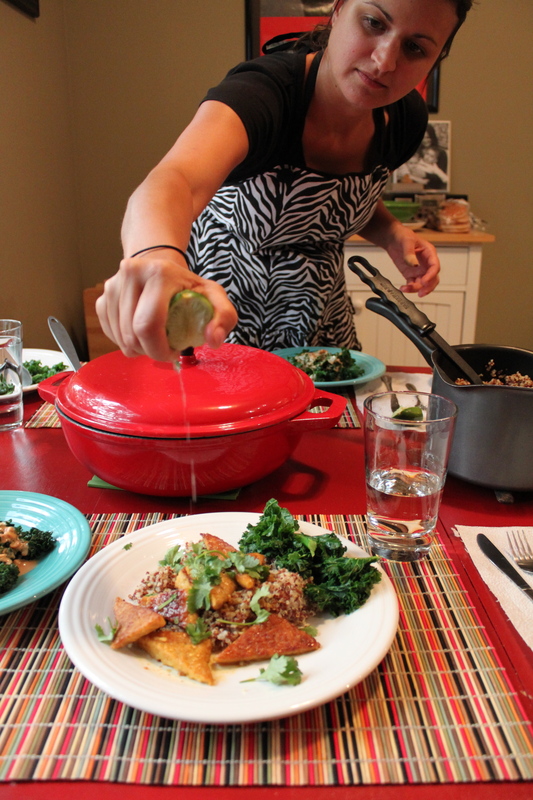 After an unintentional hiatus, Cooking Club was back in session again last week with an Asian theme. So, I’ll start it off with what WE started off with — a Mai Tai that will put you in a coma if you’re not careful. It was as beautiful as it was delicious, with fresh pineapple, cherry and mint garnishes from the lovely Amy E. from The Night Train. I took my recipe from the Foundation (thanks, Milwaukee!) and made a few amendments. 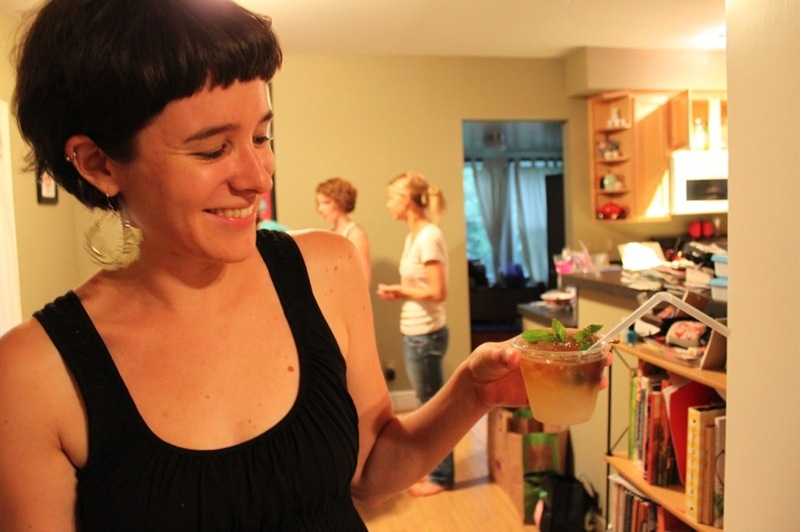 In my, uh, extensive research on mai tais, I read that there are many mai tai purists who only honor the original Trader Vic’s recipe, which calls for 17-year-old Jamaican rum and absolutely NO orange or pineapple juice, but who cares about those people? That’s it! And BE CAREFUL! As you can see, you are basically drinking a full glass of booze. I decided today I was going to make a bunch of food this weekend to have in my arsenal for the coming week, but I gave myself too many options. SO, I gave up and went to a movie when I couldn’t decide what to make first. When I got back, I decided that I was going to make one of my favorite soups of all time, even though it’s about a million degrees + humidity today. It’s nice and chilly in my house, it’s my ultimate comfort food that doesn’t leave you feeling like mashed potatoes and I haven’t had it in far too long. 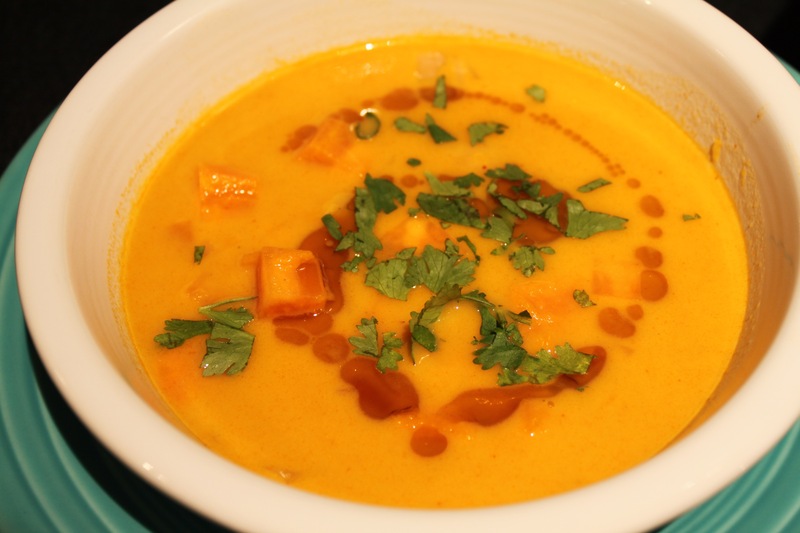 I blogged about this sweet potato soup from The Post Punk Kitchen (the authors of Veganomicon and other great cookbooks) at least once in I Eat Veg’s previous incarnation — in fact, I think it may have been one of my first posts. But I decided it’s worthy of a second post. 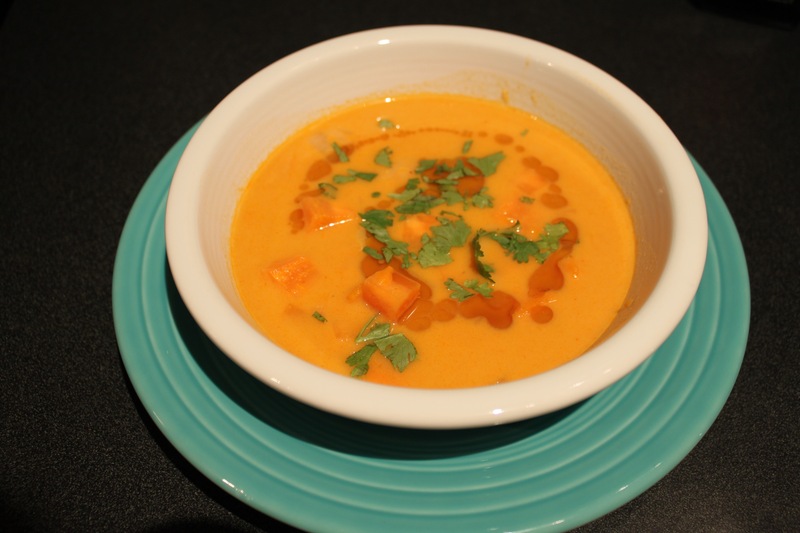 It’s really easy, really delicious, and really not spicy, so it should maybe be called sweet potato coconut curry soup — that would be more fitting. I had some kale that needed to be used up, so I decided to search for a new kale recipe too. I found one that was easy, sounded light and I had almost all the ingredients (kind of). 1. Preheat oven to 400 degrees and place potatoes directly on rack. Bake for 45 min. If you have smaller potatoes, I’d check them before that. You want them to be cooked but not mushy, as you’ll be cutting them into bite-sized pieces (not making mashed potatoes!) If you stab them with a fork to test their doneness, know that they will ooze liquid that will drip in your oven if you put them back in – FYI. When they are done, let them cool until you can handle them, then cut into bite-sized cubes. 2. In a stock pot, saute onion and ginger in oil for about 5 minutes, until soft. Add curry paste and cook for another minute or so. 3. Add coconut milk and veggie stock. Bring to a boil, then lower heat and simmer for about 5 minutes. 5. 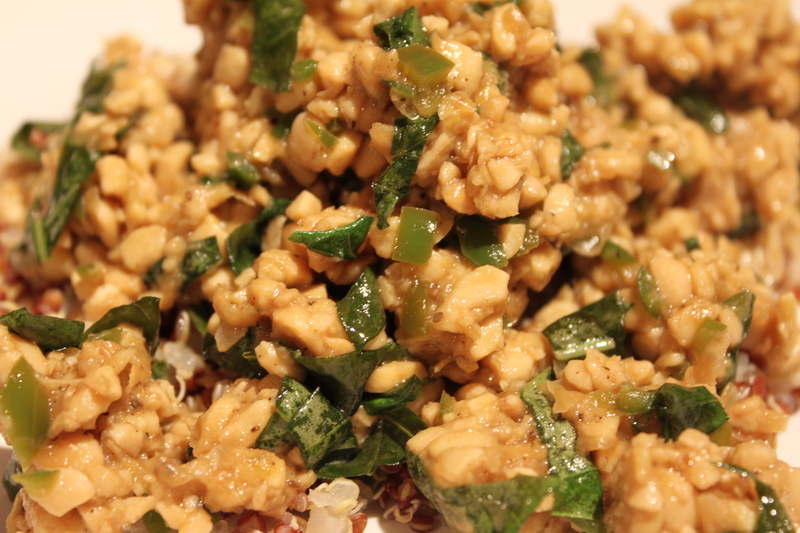 Once in bowls, drizzle with a little sesame oil and sprinkle with chopped cilantro (as much as you like). I once thought, “This soup smells so good, wouldn’t the oil and cilantro ruin it? Are they necessary?” They are essential — soooooo good when you add these two surprise elements. This soup has been a crowd pleaser! Everyone who has eaten it has loved it and it really is so, so simple (and cheap for that matter). I would say it could serve 6-8 servings so dig in! 1. Combine soy, lemon juice and oil in a blender or whisk it well. Add onions and let them marinate while preparing the rest of the salad. 2. 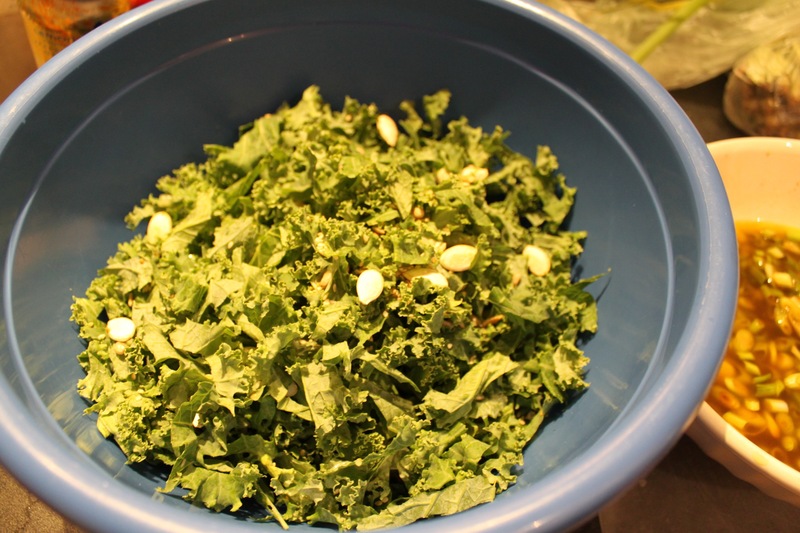 De-stem the kale and cut into 1/4″ strips. This is important! The lemon juice acts similarly to how it does in ceviche (when it “cooks” fish). It kind of “cooks” the kale, wilting it a little. I think if you didn’t cut it into smaller pieces, this might not happen as easily. 3. Separately toast each of the seeds then cool them before adding to kale. I had raw sunflower and sesame seeds on hand (a weird coincidence) and also had roasted pumpkin seeds. I think the pumpkin seeds were maybe a little tougher, since they were already roasted, but I toasted them anyway and added them. They were just a little chewy though. Maybe they would have been that way regardless. 4. 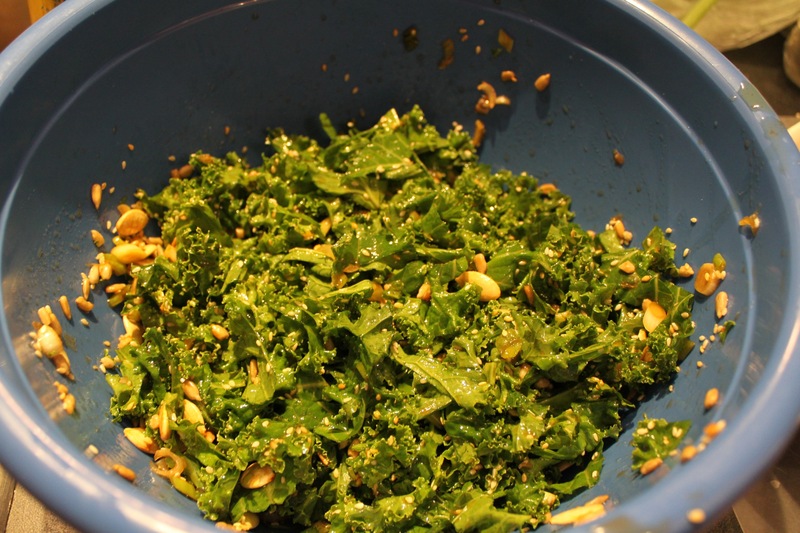 Add rest of ingredients to toasted seeds and kale. Skim onions out with a slotted spoon and add them, then add enough of the dressing to saturate the mixture, but not drench it. This ended up being about 1/2 c. for me. You are then supposed to massage it into the mixture with your hands — this helped me judge when enough was enough. Basically, everything seemed pretty well saturated and there wasn’t really any dressing sitting in the bottom of the bowl. I really like it! I think there are a lot of different things you could add to it or ways you could change it up depending on your taste (even just lemon juice and olive oil alone would probably be good!) It’s been in the refrigerator now for a couple of days and has held up really, really well — better than any kale I’ve ever steamed or sautéed, so that’s a good thing too. I just had a really delicious lunch and thought I would share. 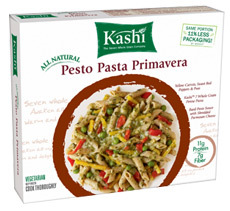 I bought this Kashi frozen meal a few weeks ago and decided to give it a shot today. It was great, with multi-grain pasta, peas, peppers, and loads of pesto. It had tons of flavor, 7 grams of fiber and 11 grams of protein — not bad! Of course it has a fair amount of sodium (about 750 grams/31 percent of your daily allowance), but it’s only 290 calories and really was delicious. I’ll definitely buy it again to keep on hand in a pinch. I’ve never cooked tempeh before and I’ve only eaten it once or twice. Basically, D doesn’t like “fake” meat, so I assumed he wouldn’t like it because it’s kind of “meaty.” Then I saw some at the store and decided “screw it,” and bought it anyway. I decided to slip it into a dish and we’d see what he says. Like when someone swears they don’t like Chinese food, then you make them sweet and sour tofu and they love it. Or when you’re sure you don’t like green olives, but when presented with tomato juice and vodka, it changes everything (that would be me). But I digress…I did a quick search for tempeh recipes and quickly came upon one that sounded unique — something that’s neither Asian or Mexican (which seems to be happening a lot lately). I stumbled on the recipe on the blog 101 Cookbooks, which had gotten the recipe from Australian cookbook author Jude Blereau. The recipe definitely was a success! We both loved it (D was glad I decided to ignore his imaginary tempeh aversion!) and it was so nice to have a completely new flavor going on. The recipe calls for one 10 oz. package of tempeh and I had two 8 oz. packages on hand, so I just decided to go for it and throw both in. This was fine, but I really should have also doubled the orange glaze/sauce. The flavor was there and it definitely seeped into the quinoa I served it over, but you can never have too much sauce, right? The more the merrier I say. It was really easy and really delicious. I’ll definitely make this again soon. 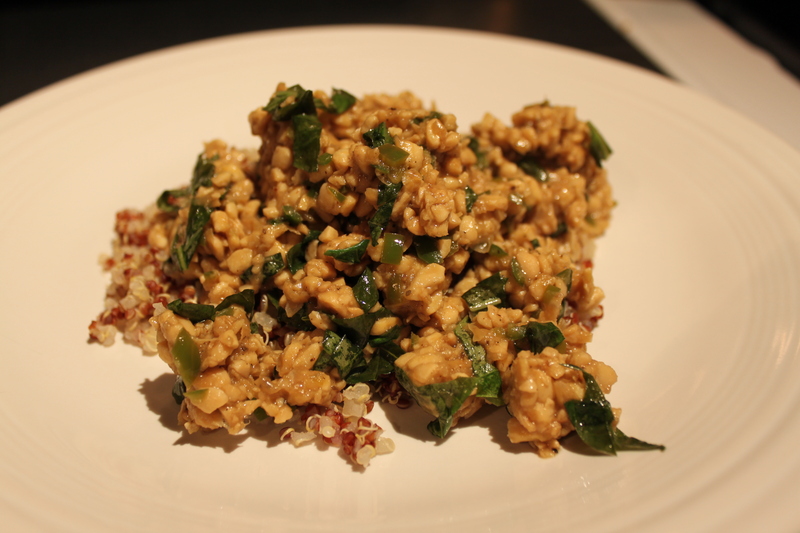 OH — not sure what the heck tempeh is? Check out www.tempeh.info — but don’t be afraid. There’s talk of fermentation and mold, but it’s made out of soybeans, just like tofu. It’s a great source of protein, is great for digestion, heart health, it’s said to ease menopause symptoms and so much more. And don’t be afraid if it’s a little black or looks moldy — that’s normal. 1. Put the orange juice in a bowl. Squeeze grated ginger or the bowl to extract the juices (I used cheesecloth, but you can just use your fingers/hands obviously), then discard the pulp. Add the maple syrup, tamari (I used soy sauce), mirin (oops — I forgot to buy some at the store! Since it sits somewhere between sake and rice vinegar, I used rice vinegar, then put a little extra syrup in for sweetness), ground coriander and garlic. Mix and set aside. 2. 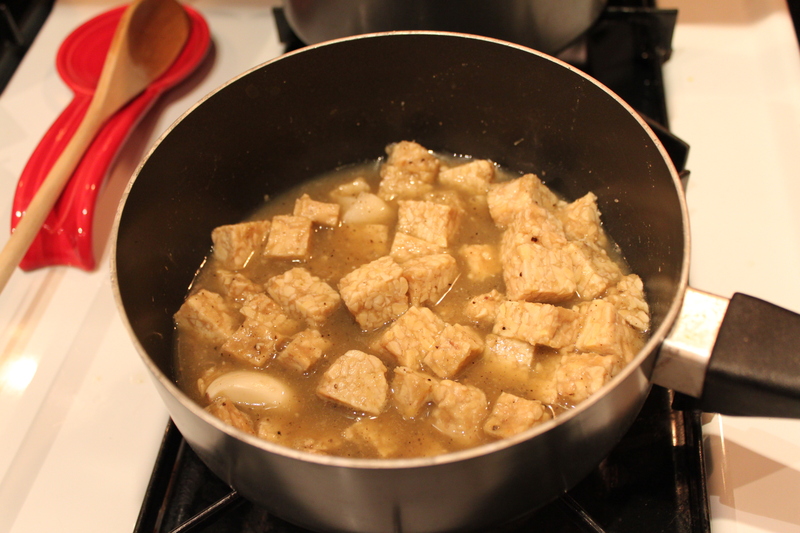 Cut the tempeh or tofu into thin-ish bite-sized pieces, patting tofu dry with paper towel if that’s what you’re using. I was using tempeh, so I cut the entire block in half lengthwise (so I had two long, thin rectangles), then cut it into triangles, to mimic the picture on 101 Cookbooks. 3. Put the olive oil in a large frying pan over medium-high heat. When the oil is hot, but not smoking, add the tempeh in a single layer and fry for 5 minutes or until golden underneath. Then flip and cook the other side for 5 minutes (this was the only other problem with doubling the tempeh — there wasn’t room for all of it to fry at once, but I worked it out). 4. 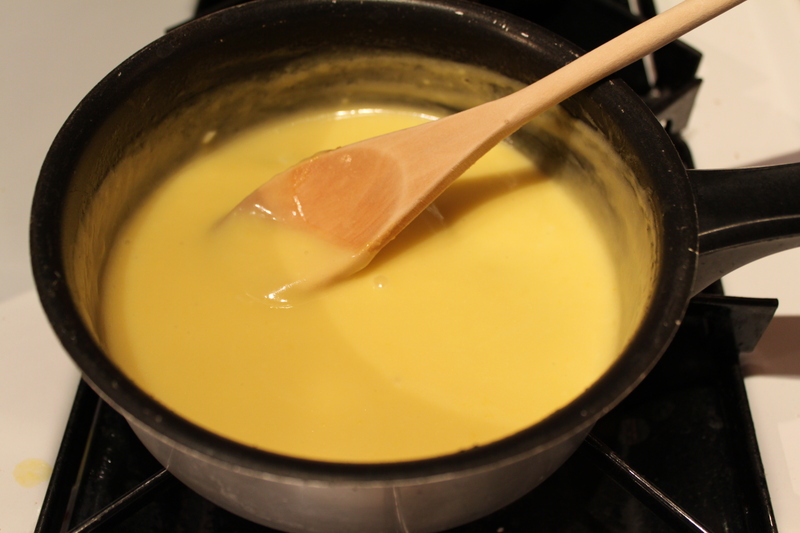 Pour the orange juice mixture into the pan and simmer for 10 minutes, or until the sauce has reduced to a thick glaze. Turn the tempeh once more during this time and spoon the sauce over it from time to time (I mostly just stirred it up/flipped the tempeh around from time to time…). Again, I wish I had doubled it considering the fact that I used 16 oz. of tempeh. But for 10 oz., I’m sure this amount of sauce is perfect. I had some kale on hand, so I served this with some kale on the side…with a ridiculously good peanut sauce. 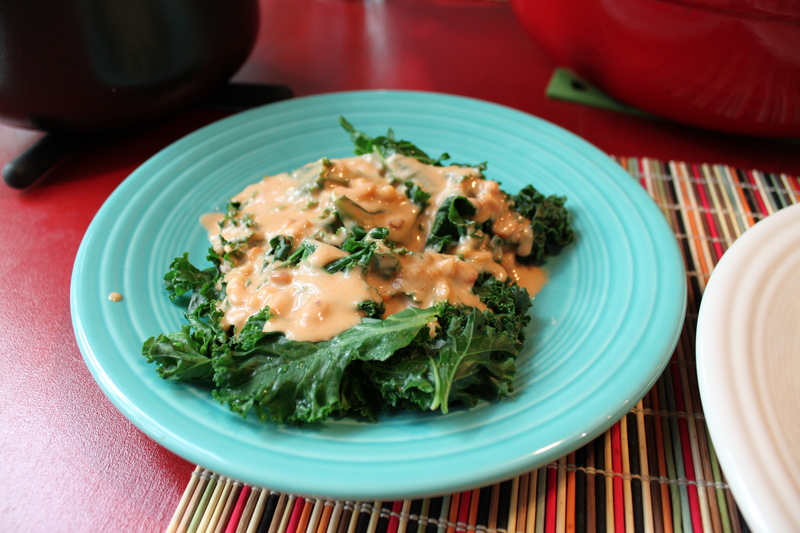 I’ve tampered with the recipe a bit since I posted it (essentially adding 1/2 to 3/4 can of coconut milk), but I first came upon this kale-peanut sauce combo thanks to my friend Angela at our first cooking club gathering. Since there are some similar flavors going on in both dishes (ginger, soy, garlic, rice wine vinegar…) I decided to go for it. I mean, you can’t go wrong with peanut sauce in any situation, I say. 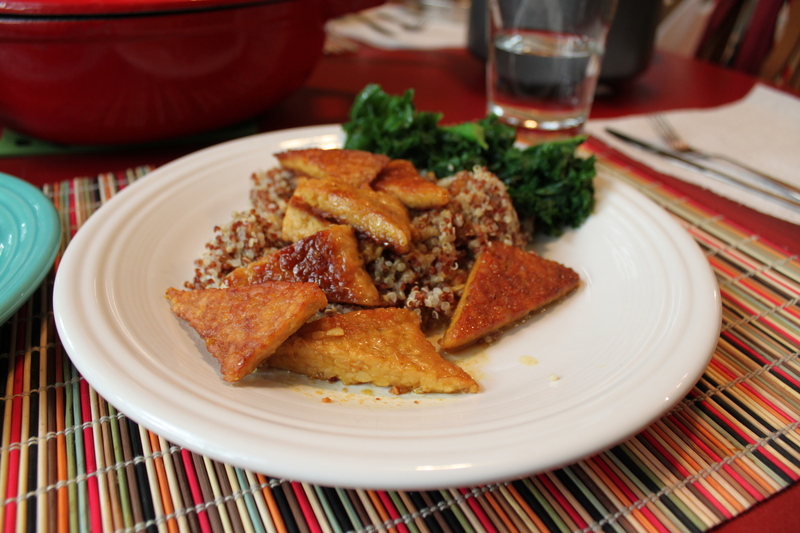 I’m officially a tempeh convert… in fact, I’m off to make a new recipe now — stand by! I’m not going to beat around the bush here: Hollandaise Sauce is a heart attack in a gravy boat…but it’s so good! 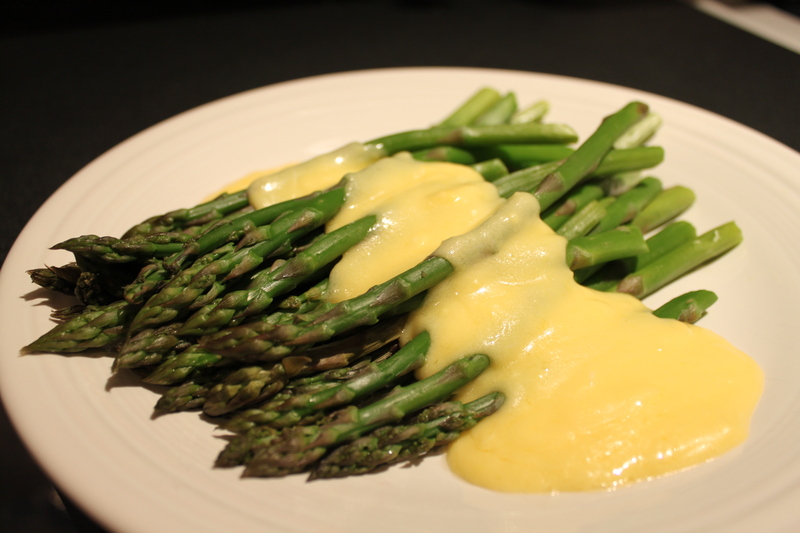 We grew up eating Hollandaise on asparagus, and it remains one of my favorite things. It’s why I can’t quit my Eggs Benedict addition — although obviously, I’m not eating the old hammy version. Lately I’ve had some delicious versions in New Buffalo, Chicago and Ferndale involving everything from tomatoes and spinach to asparagus and black olives. While I was taking photos when I made this the other night, I realized I need to give vegan versions a chance. I can get used to it like anything else, right? I did find a couple that look pretty good: One from TasteSpotting and one from Vegetarian Times (which also explains how artery-clogging this deliciousness can be). In the meantime, here’s the original. If you’re using one of those powdered mix pouches, you’ll never go back. This is so easy and sooooo delicious. Stand by for testing out the vegan version! Cook the asparagus however you like — I know some people who will place it in a microwavable dish with a half-inch of water and steam it in the microwave for a minute or so. I choose to steam it. I put an inch or two of water under the steamer, cover the pot and get the water and get the water boiling. I usually wait until I’m well into making the sauce before actually putting the asparagus in the steamer. Not that it would stop me from eating it… but asparagus is best when it’s cooked to bright green, still has a bit of a bite, but will easily fall of a fork when stabbed. At least in my opinion. My steamer’s pretty beat up, but it works! 1. Separate eggs, putting two egg yolks in a shallow saucepan with the lemon juice, break yolks and mix together. 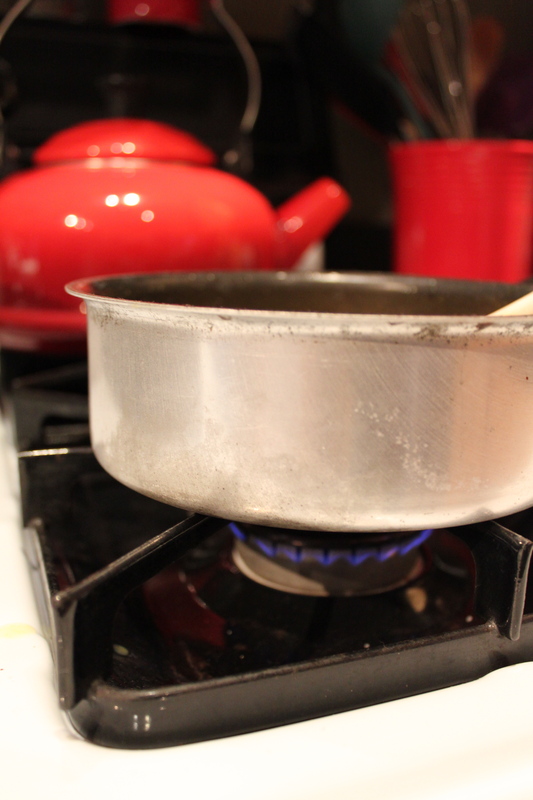 For some reason I always use this one old beat-up pan to make this — it’s just the perfect size. 2. Add half of the stick of butter and stir constantly over the lowest heat possible — it will seem like it’s going to take forever, but just keep with it — it will happen. 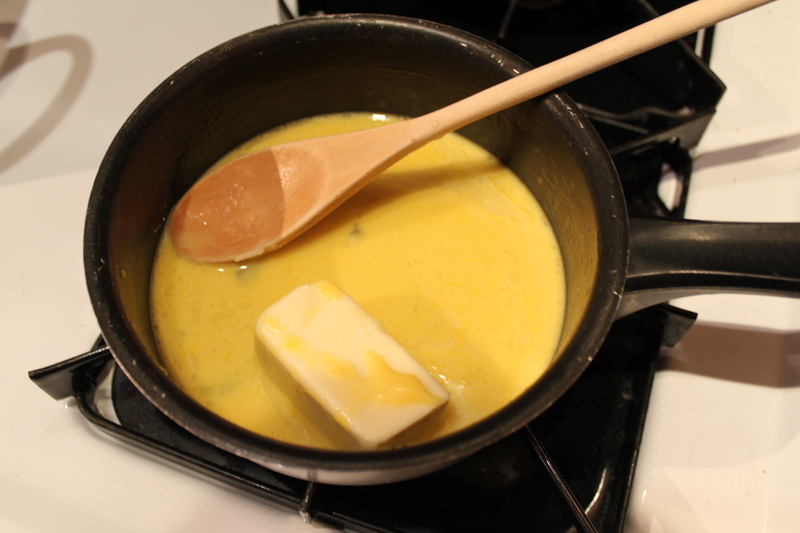 When the butter is melted, add the other half of the stick and continue stirring until it’s melted too. It will be thick and creamy — or will get there. 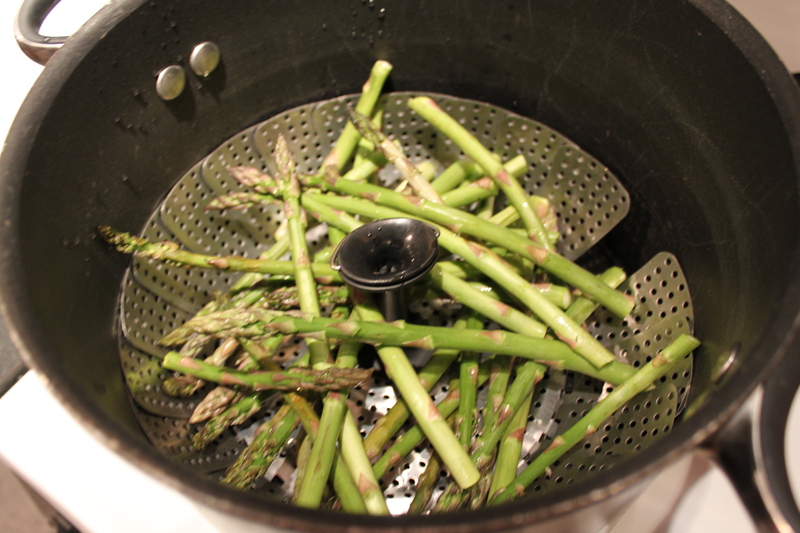 Sometimes, it needs to cook a few minutes or will thicken upon standing, as I fetch the asparagus. If you happen to step away from the stove for a minute and things seem to coagulate (basically, the eggs can scramble if you’re not careful) sometimes if you whisk or stir it really fast you can whip it into shape. There are a lot of variations out there, but this one has proven to be tried and true. I’ve always wanted to mess with adding fresh herbs, but maybe that’s a good way to transition into the vegan version. If you have any versions (vegan or not) comment and let me know – I’d love to try some new things!